Mourners came together today at the church in which Whitney Houston grew up, New Hope Baptist, in Newark, NJ. Celebrities, family, and friends packed the church where she sang at as a child, to remember her as a musician, and as a real person who at times struggled in life. 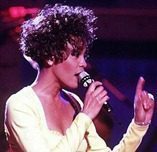 Other speakers at the service included: Clive Davis, who discovered Houston after seeing her singing in a nightclub; Gospel singer and fellow Grammy winner Bebe Winans; and Ray Watson, her real life bodyguard, who told attendees of her last day of life. Houston’s cousin, Dionne Warwick, presided over the service. Houston’s godmother, Aretha Franklin, fell ill and was unable to perform at the service as planned. Others that did perform included Stevie Wonder, Alicia Keys, R. Kelly, and CeCe Winans. At the end of the nearly four hour service, Houston’s “I Will Always Love You” was played as mourners filed out of the church. The nearly four hour long service was streamed live over the internet for Houston’s fans.